In her lecture, Dr. Winter revisited the traditions of modernist abstraction and argued that Hermann Sigg's luminous canvases of mesmerizing color and innovative mutations of primary forms, have married previous traditions with post-modern concepts of the sign, to inspire a new way of seeing. With his vision and virtuoso skill, Sigg's transcendent landscapes revitalize and map out a new direction for contemporary painting. Amy H. Winter, "Reading the Signs: The Art of H.A.Sigg." 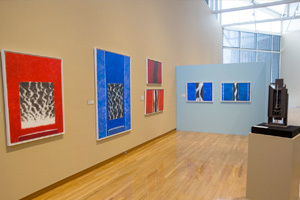 Lecture, Miami University Art Museum, Oxford, OH, March 13, 2014. As an institution devoted to the appreciation of visual culture and higher learning, the Miami University Art Museum is pleased to be a venue for exhibiting the paintings, collages and sculptures of Swiss artist H.A. (Hermann Alfred) Sigg. The artist, who will turn 90 in June 2014, has spent the past seven decades exploring the visual vocabulary of abstraction in an attempt to reveal the essence of places seen, people known, moments in time and the artist’s state of mind. For most of his career, nature – land, water, sky – has been the heart of his work. Even the structures and people that inhabit these spaces are represented through the artist’s lyrically composed abstract landscapes and totemic sculptures of an architectural and figurative manner. Sigg’s interplay of spatial relationships, bold flowing passages of manipulated color and constructed environments are at one moment energetic, the next calming and meditative, yet always speaking to the soul.